Do you live in the Minneapolis Saint Paul Mn area and Have a tree that needs trimming or removal? Are you looking up at that big ole tree in your yard and thinking maybe it’s time to think seriously about hiring a tree removal company and taking it down? There are some things that can be done to save many types of trees but just like humans disease and old age can take their toll. Deciding whether or not to have a tree removed is not just a reasonable choice depending on how long your tree has been there it may also be an emotional decision. It’s not uncommon for trees to be several decades old and to have been in 2nd 3rd or 4th generation families. The importance of trees to the environment is understandable but what about the importance of a tree to your property or community? Making a decision to remove a tree is a rather complex one but it also requires proper planning and prep. If a tree in your yard has been deemed hazardous by your local authorities you may be told there is a potential for limbs to fall and tree debris making a hazard to yourself, your neighbors or surrounding property. 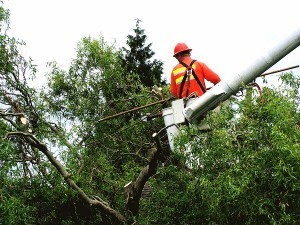 It may be possible to nurse ailing trees along but eventually that day will come when hiring a tree removal company is going to have to be considered. How is the tree’s current health? If a large percentage of a tree is deemed unhealthy or damaged even, The removal of your tree may come sooner than later. The last thing you need is a large tree lib falling onto your or your neighbors property. Is the tree solid throughout? Trees that have damaged cores are an immediate hazard. Loosing your core stability leaves you vulnerable to heavy winds rain storms and may be a sign there is a lot more going on to your tree than meets the eyes. What species is the tree? The type of tree can have play a pivotal role in when it’s time to consider removing it. There are certain types of trees such as Boxelder, Willow, Poplar trees etc. that will exhibit signs of ill health or weakness and will have to be removed by a professional tree removal company. Is there damage to the roots? If there is obvious damage to the root system your tree may be in trouble. Root damage can be caused by bugs such as termites or disease like root rot. You may also have had physical damage due to storms or recent construction work in the area. Does your tree have room for future growth? If you have the type of tree that needs lot’s of space and your situation is limited, you may want to consider replacing your tree with a type that is more suited to your area. Trees that have been planted to close together or are in an area of sandy soil or too much shade may get stunted and eventually fall victim to being choked off. If your situation needs the eyes of a professional tree removal or trimmingcompany contact Ivans Tree Service. Tree removal and trimming in St Paul and Minneapolis Mn.